I get so many requests for low carbohydrate recipes, I wish I had a dollar for every time I get asked. I’d be a bazillionaire! It does speak volumes about the popularity of low carb diets though. For some, it’s about losing body fat and maybe some weight. For others, it’s a lifestyle choice due to health factors like Type II diabetes, food intolerances, or carb sensitivity. For others, it just makes them feel good. Whatever the reason, there is no need to feel as though one has to miss out much on foods that are typically high carbohydrate. Breads, cakes, snacks … there are so many options. Nut flours and lower carb flours make life more nutritious and lower carb without deprivation. One such flour that is gaining popularity but is perhaps less well-known, is lupin flour. Lupins are a legume and popular in some Mediteranean cuisines. Unlike many other legumes, lupins are quite low in carbohydrates while containing healthy omega fatty acids, a whopping dose of dietary fibre, and they pack a solid punch of protein. There has been a lot of commotion about the potential for lupin flour use in breads to boost nutrition and give greater satiety thereby aiding weight loss, as well as it’s ability to help lower cholesterol and provide a range of nutrients. Bread makers are starting to make lupin flour breads and they are gaining in popularity. That’s all good. But ultimately, I say yay because it’s high in protein, low in fat and carbs and high in dietary fibre. Lupin beans are about 45% protein and 30% dietary fibre, and have negligble carbohydrate. That is awesome. On the downside, being a legume, it is likely that it may cause problems if you happen to react to FODMAPS, specifically fructans and galactans. In particular, it’s likely to contain galactans as most legumes do. I have yet to see it on a list of FODMAP foods, but it’s a reasonable assumption. But that is not to say that it will cause someone a problem. These things are highly individual. So it might be worth checking out. OK. So, how does this lupin flour bake up then? Well, I like to go easy early on trying out a new flour so I went for muffins. 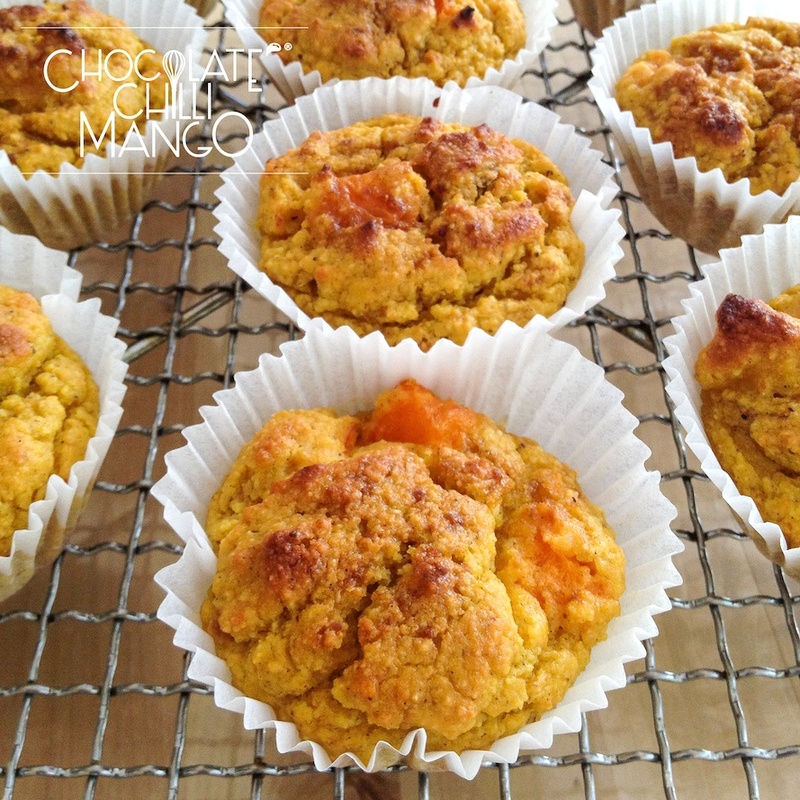 I’ve wanted to make my mum some low carb healthy muffins and these really hit the spot. She likes her muffins fruity and is a big fan of the wheat free muffins I make for her, especially those with almond flour. They have a lovely fall-apart, flourless texture but are not heavy or stodgy. 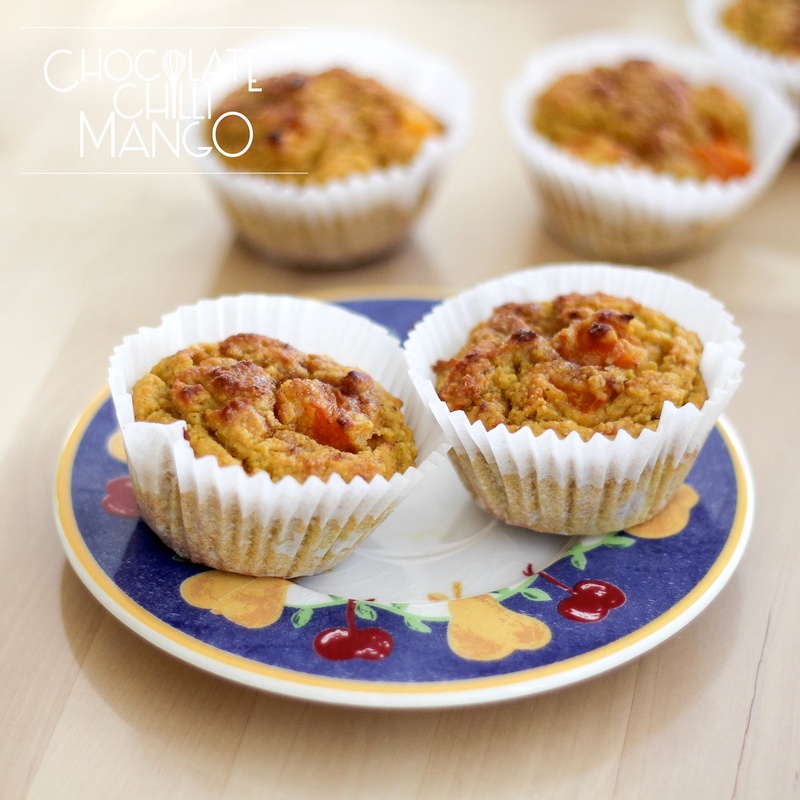 Apricots are in season now and apricots and almonds are a great combination. You could substitute whatever fruit you like but be aware of the impact on the carbohydrate count. 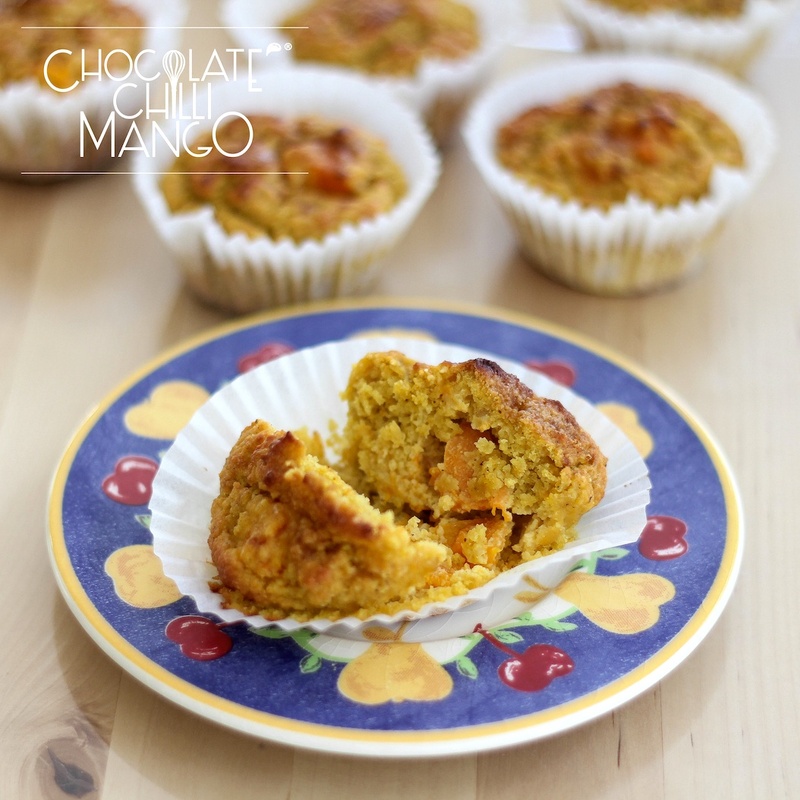 One usually discounts fruit when thinking about a low carb option but these muffins prove you can enjoy a fruity muffin without a carbohydrate blow out. Alternatively, you could leave out the fruit and just make them vanilla, or add some chopped up 100% chocolate or spices, or anything else you fancy that meets your low carb requirements. Great, so where do I buy this lupin flour, CCM? Well, I don’t know about elsewhere but here in Australia, Lotus Foods make a really good lupin flour that is widely available in health food and organic shops. I have yet to see it in a supermarket but I suspect it’s only a matter of time. You can also get it online. I have used a granulated stevia based sweetener in place of sugar. You can substitute your preferred sweetener, knowing that the amount in the recipe is equal to the same amount of sugar, so please substitute accordingly. They taste fantastic! I hope you enjoy them too. Preheat the oven to 180ºC. Line 10 muffin molds with muffin liners and set aside. 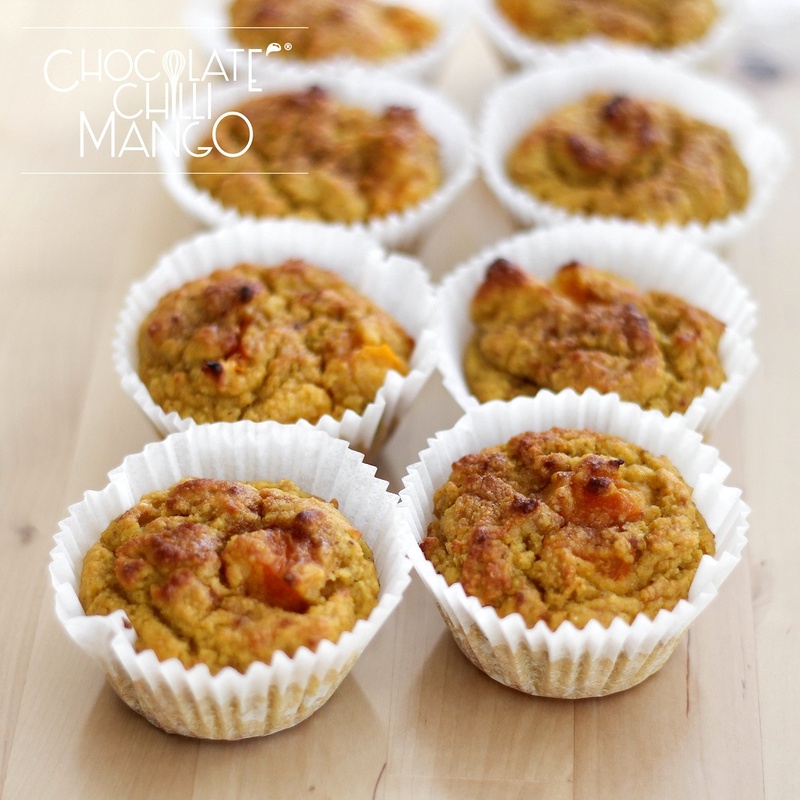 Mix together the almond meal, lupin flour, sweetener, and baking powder in a bowl. Make sure you break up any lumps. Toss in the diced apricots. Whisk together the eggs, almond milk, and vanilla bean paste. Add the wet ingredients to the dry mixture and mix lightly with a fork. It’s okay if the mixture is a little lumpy as these are muffins. Do not over mix the batter. Pour the batter into the 10 lined muffin tins. Bake for 25 to 30 minutes until risen, golden, and a skewer inserted comes out clean. Cool on a wire rack before turning out. 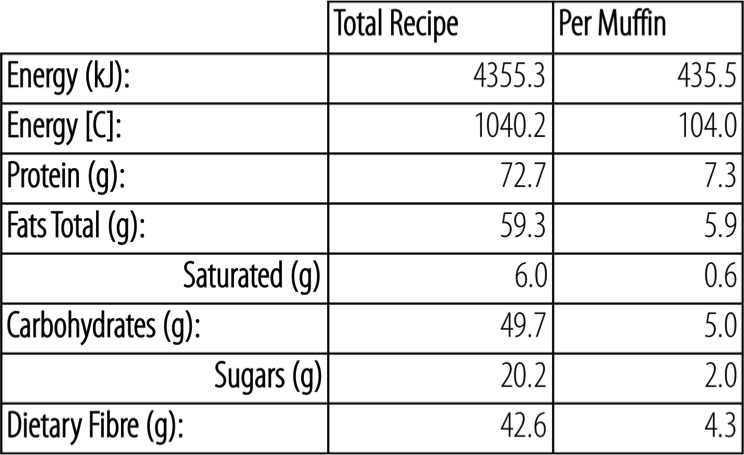 I have included macros for the recipe as stated above. Any variations and substitutions will, of course, vary the macros to some degree.